PK: … [W]e make sure everyone knows what our government’s position is. We make sure we speak to issues with a united voice. SP: So that’s why you, and the prime minister, and other ministers all end up using the exact same quotes when you answer questions? PK: Yes. So when we’re asked about the Israeli position on settlements, we never criticize Israel publicly. We say those settlements are “unhelpful” in finding a comprehensive peace settlement. We’ve put on the record our position on nuclear power and India. We say “it’s no longer the 1970’s, it’s now 2009.” I saw the prime minister’s quote in the newspapers to that effect yesterday, and so I used it today. In a Globe and Mail interview last week, Kent outlined his other qualifications, namely a work history as an oil and gas purchasing agent in the 1960s, as well as a journalist covering the controversial northern gas pipeline hearings in the 1970s. Clearly Kent is someone who can look at both sides of an issue and come down on the “right” side. Every time. Those abilities were on full display in the January 6 CBC Power and Politics appearance with host Evan Solomon. Here are a few choice excerpts, so you don’t have to watch the whole 20 minutes and get thoroughly depressed. (You’re welcome). Solomon: Part of it that was we had a reduction from activity .. because of the recession. Kent: Part of it … and also industrial reduction. There’s not an awful lot of coverage [of] that technology improvement, for example in the oil sands, which I believe have had a bad rap in recent years. The GHGs that are emitted to produce a barrel of oil from the oil sands have been reduced in the last 20 years 39 per cent. Here’s a chart of total GHG emissions in Canada from 1990 to 2008, taken from the latest Environment Canada annual report, A Summary of Trends: 1990-2008. Canada’s 2008 GHG emissions decreased 2.1% from 2007 levels, attributed partly to a slowdown in economic growth which began in 2008, and the utilization of greater amounts of hydropower for electricity generation. And, according to the detailed sector-by-sector breakdown, mining and oil and gas extraction was the only emission source in the stationary energy category to see a rise in GHG emissions from 2007 to 2008. 2008 emissions were actually slightly higher at 734 Mt than the 2005 baseline of 731 Mt, although down from the 2007 peak. Then how can Kent claim that “almost quarter” of the 17 per cent target – that is 4 per cent or 30 Mt – has already been achieved? It turns out that the estimated figure for 2009 in Environment Canada’s 2009-2012 projections, ironically released as part of the 2010 climate change plan for the Kyoto Accord, stands at 701 Mt, which is indeed 4 per cent below 2005 levels. If we add that to the 2005-2008 GHG emissions reported by Environment Canada (as seen above), we get the following chart. Looks impressive. But not so fast: does this really represent actual progress towards the 2020 target of 607 Mt? Not a chance. Here is the bigger picture using the complete estimates from the same Environment Canada Kyoto plan, which assumes continuation of current federal policies and programs, and moderate annual economic growth of 1.6 per cent over 2008-2012. Clearly the blip in 2009 was mainly due to the economic downturn, despite Kent’s bluster to the contrary (Canada’s GDP was down a full 2.5 per cent in 2009, according to the 2010 federal budget assumptions used in the Environment Canada). Now there is some variation in estimates of projected GHG emissions in 2020 from oil sands operations under the current unconstrained regime, but all agree that they will more than double and perhaps even triple current emissions. In an August 2010 briefing note, the Pembina Institute noted that total 2020 GHG emissions in Canada from oil sands operations alone were projected by the Canadian government to reach more than 108 Mt per year (as seen in Conservative government’s reference case for the 2008 Turning the Corner climate plan). Even that is at the very low end of Pembina’s own projections which go as high as 140 Mt per year by 2020 (an astonishing 20 per cent of Canada’s current total). 2008 oil sand emissions were 37.2 Mt. Even if we assume only doubling of that figure to 75 Mt in 2020, that still puts the modest 17% target well out of reach. Under that overly optimistic scenario, the 2020 target would still include about 530 Mt of non-oil sands GHG emissions, down from just under 700 Mt in 2008. That means that all other sectors would need to achieve a staggering 24 per cent reduction in GHG emissions relative to 2008 levels. At a more realistic level of 100 Mt for 2020 (which still assumes uncertain large improvements in efficiency or a slowdown in oil sands development from current projections) the required non-oil sands reduction in GHG emissions reaches 27 per cent; at 120 Mt, the required compensating reduction for all other sectors combined is 30 per cent. And remember, almost all of the reduction will have to come after 2012 – that is, over a period of only eight years – if the above current government estimates are correct. Deleterious impact on the climate is far from the only basis for criticism of oil sands operations. Also of grave concern is the potential contamination of the Athabasca River and its watershed. In a 2009 PNAS study by Kelly et al, a team of scientists including University of Alberta ecologist David Schindler, showed that “oil sands development is a greater source of contamination than previously realized”. Levels of polycyclic aromatic compounds (PAC) were observed at much higher levels at locations near and downstream from oil sands operations, as seen in the key Figure 4. Kelly et al 2010 (also in PNAS) stated that “the oil sands industry releases the 13 elements considered priority pollutants (PPE) under the US Environmental Protection Agency’s Clean Water Act, via air and water, to the Athabasca River and its watershed”. (Released PPEs included elements such as copper, cadmium, lead, mercury and arsenic). Although the reported levels were well within the Canadian guidelines for drinking water safety, seven of the PPEs were found in concentrations that threaten aquatic life, according to Nature. The studies’ findings raised serious questions about the Regional Aquatics Monitoring System (RAMP), run jointly by the Alberta provincial government and industry. In response, then federal environment minister Jim Prentice commissioned a study of RAMP to assess its strengths and weaknesses, and make appropriate recommendations. That study, released in December, criticized the current monitoring system, and recommended “transformation” of its “elements” into a new “first-class” system, based on proper application of scientific principles and transparency, both of which appear to be sorely lacking currently. When Solomon tried to refer to the work of David Schindler, Kent immediately interjected: “He’s wrong.” And he continued to insist that “my scientists tell me” there is “no scientific evidence” of leakage or seepage from tailings ponds. But although Schindler has expressed grave misgivings about the potential catastrophe of tailings ponds (and there have been unconfirmed reports of leaks at one tailings pond), Kent’s exposition entirely misses the point. In the 2009 study, the presumed mechanisms of pollution are airborne transport and land disturbance, not tailings pond leakage. And the analyses of the spatial pattern of Schindler’s results leaves little room for doubt about that oil sands operations are to blame, despite the protestations of the Alberta government and industry representatives. On the other hand, Kelly et al 2010 did find evidence of leakage or discharge of toxic elements (PPE ) into the Athabasca River from tailings ponds, in addition to airborne pollution. Concentrations of three PPE and four other elements known to be increased in oil sands process water are much greater in the AR only near tailings ponds or oil sands development in winter. This finding suggests tailings pond leakage or discharge as sources of elements to the AR. Kent’s attack on Schindler raises a red flag, and is best seen as part of the Conservative war on basic science, especially that with environmental implications. A disturbing pattern can be seen in the Conservative shift of funding from basic research, to industry-friendly initiatives of highly uncertain value, as well as a string of dubious appointments to various advisory and funding bodies. (The most outrageous of these might well be the appointment of ex-Fraser Institute head Mark Mullins to the governing council of NSERC, the main federal science research funding body. Mullins oversaw the Institute’s execrable Independent Summary for Policymakers in 2006-7). Oil sands: the latest weapon in the war on terror? A full 12:30 into the interview, we finally get to the main event, where Ezra Levant’s preposterous “ethical oil” meme gets elevated to government policy. Kent: We need to reassure the American administration and the American people that Canadian oil is ethical in every sense of the word. It’s regulated. It’s the product of a natural resource whose revenues don’t go to fund terrorism or destabilization of other governments. Solomon: But is your job to protect the oil sands or is it your job to protect the environment? Kent: We’re also doing this in terms of environmental control and oversight, the mitigation of the exploitation, the legitimate exploitation of a wonderful Canadian resource. And also it’s ethical in the sense that the revenues gained from the development of the oil sands, the production of the oil sands, the sale of the oil, is shared with the people, the environment and the wildlife of the habitat. Let us pause to admire Kent’s beatific smirk as he contemplates sharing the oil sands revenues with “the wildlife of the habitat”. Heartwarming, isn’t it? More seriously, let’s also take a quick look at the source of this latest spin on the oil sands. Last September, Alberta columnist and provocateur Ezra Levant released Ethical Oil, a manifesto extolling the many virtues of the oil sands and rebranding it as anti-terrorist and environmentally friendly. Reading the introduction is most enlightening. There you’ll find quite a few of Kent’s talking points, some expressed more forthrightly. We find out that Saudi Arabia “has used its oil money to bankroll terrorists”. And that oil has been seeping into the rivers around Fort McMurray “for millennia”, and water is sometimes “cleaner adjacent to an oil sands operation” than locations upstream where exposed bitumen has been leeching “for thousands of years”. For readers unfamiliar with Levant, he’s best known as a right-wing ideologue who has engaged in a running battle with various human rights groups and tribunals. Virulently pro-Israeli and anti-Muslim, Levant has also found himself in hot water for various falsehoods, notably when he accused financier and philanthropist George Soros of having collaborated with the Nazis as a child. The “ethical oil” argument would have Canadians forget all about the serious and so far unresolved negative impacts of unrestrained development of the oilsands, and ask ourselves instead whether Canada’s system of government is better than Saudi Arabia’s or Iran’s. Of course it is — but that only means Canada is better equipped and has even more responsibility to address the unresolved social, economic and environmental implications of oilsands development. The misleading rhetorical device is bad enough. But even worse, Kent claimed to have relied on so far unnamed Environment Canada experts in the two specific cases described above. I’m sure those experts would be appalled to find out that cherry-picked factoids have been used to support broader false statements. And, make no mistake: that’s exactly what happened here. It’s unacceptable to rely on a one-year blip as evidence that GHG emission reductions are “on course”. By the same token, David Schindler’s research has clearly demonstrated airborne and soil disturbance contamination by oil sands operations, as well as evidence of leakage of some toxic elements from tailings ponds. The only peer-reviewed science on contamination by the oil sands can not be glibly dismissed as flat-out “wrong” by pointing to lack of evidence for a specific contamination (bitumen PAC from tailings ponds) not even discussed in the research. The only question now is whether Kent understands that his statements were false. I tend to think not, and would guess that one of his political aides, or perhaps a hack from the prime minister’s office, cooked up these particular talking points. After all, Kent himself has noted the importance of a “united voice”, conceding that that often leads to the use of the same talking points, or even the same exact wording. It will also be interesting to see if the government will permit the unnamed Environment Canada experts cited to be identified and allowed to talk to the media or general public. Towards the end of the CBC interview, Kent complained about the “exaggeration” of problems in the oil sands, in particular their contribution to domestic or international greenhouse gas emissions. This is a recurring theme; Kent went so far as to tell the Calgary Herald that “there has been a lot of disinformation and outright misinformation” about the oil sands from its critics. But on the evidence so far, the disinformation is coming from Kent himself and the Canadian government, which resolutely refuses to deal with the real issues around oil sands development. Smart politics? Maybe so. Ethical? No way. An excellent article – thanks! I’ll definitely link to it from my own Ethical Oil Sands? piece which is much smaller. However, you might like to see the RBC (Royal Bank of Canada) action which I note there and linkage to the Schindler et al studies which show increased polycyclical aromatic compounds downstream from oil sands processing plants. Ugh. Kent could have easily worked for Bush or in AK for Palin or Barton or Inhofe. 1) Has no idea whether they are true or false. 2) Knows enough to know they are false and says so anyway. 3) Is concerned solely with message; truth or falsity is simply irrelevant; the question wouldn’t’ even make sense to him. That is a terrific question. The answer seems quite clear, and quite unfortunate that the environmental minister is more interested in protecting the oil sands than the environment. I wonder if there will ever be tribunals to judge “environmental criminals” as there are now for war criminals and torturers. Kent et al. disgust me…and that is the polite version. What they are doing here is completely disingenuous. Not to mention the problems with playing loose with the facts. Let us be clear, the Harper government has no intention whatsoever of meeting even trying to meet the 17% reduction. They are hoping that people will forget, and many will, but the valuable work of reputable and ethical people like DC might mitigate that. Needs to be asked again and again and again. I wonder what McIntyre thinks of all this? Oh right, he does not even know whether we facing an issue at all when it comes to AGW/ACC. 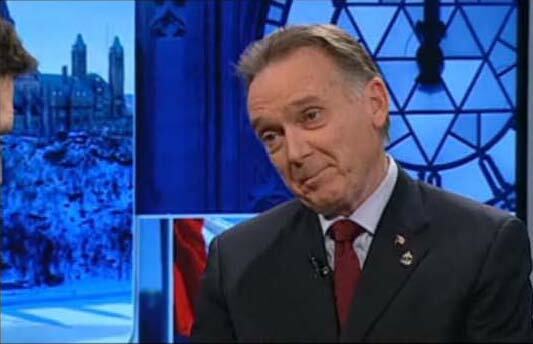 Peter Kent is an un-qualified lightweight selected for his obedience and regional appeal (a rare Ontario member of Cabinet). His enthusiasm for scripting makes me wonder what he hoped to accomplish by entering politics. He’s gone from being a second-string newscaster to… a second-string politician. You made a point of highlighting the claim that the per-unit carbon emissions for the production of oil sands had decreased. But you didn’t say anything about the claim, that I could see. Well, did the per-unit carbon intensity of oil sands production decrease? It could well have. Remember that the industry’s overall emissions could go up, while having that intensity go down, if they increased the production rate in the meanwhile. The point here is that this was a red herring in several respects, not that the intensity figure itself is wrong. Yes, per-unit carbon intensity has lowered, but it is not germane to Kent’s point. Kent brought it up in the context of a recent drop in toal GHG emissions. Intensity reductions since 1990 don’t really matter, especially since any intensity reductions have been swamped by increases in activity in the oil sands, and so can not be credited with the short-term blip. That’s why I made the point that oil sands emissions were going up, even in a year when total emissions in Canada went down. Also indications are that intensity is now dropping more slowly, and is not expected to drop much further over the next decade (but this is a complicated subject). The real point which Kent refused to address is that total GHG emissions from the oil sands will at least double and quite possibly triple between now and 2020. Thanks, that clarifies your point. Interesting commentary from Jeff Simpson in the Globe & Mail today: Does Peter Kent even care about emissions? It’s curious. Simpson leads off with these first two paragraphs, but then he never comments on them again. Did Kent really start meeting with people like Evan Solomon before even being briefed by his own Ministry??? “It was a pity, although quite predictable, that new Environment Minister Peter Kent should have leaped to defend the oil sands even before being briefed by his department. I greatly admire Simpson who appears to be the lone voice of forthrightness on climate change issues at the G&M. But he clearly needs to read Deep Climate. As I showed above, Kent actually claimed to have based both his defence of the oil sands environmental record, and the “on track” boast, on briefings with Environment Canada officials and scientists. Talking of ethics and big oil. Have you seen this? I tried to post some information earlier today, but maybe it went to your spam filter or something. So if he was actually claiming to quote his scientists before then, he may have been lying straight out or perhaps had been told be someone else what the scientists supposedly said..
As noted above the interview was on January 6. I’ll have to go back and get the exact full quote in context, but he definitely did say “my scientists tell me” that “there is no scientific evidence” of contamination from tailings ponds. I don’t see any possible wiggle room there. We are committed to hit our 17 per cent reduction by 2020, and the good news is, and I can tell you this today, and this is the product of my briefings my first week in the department … we’ve already achieved almost a quarter of that 17 per cent reduction. We are on course to hitting our targets by 2020. Now I suppose one could claim, yes, it was the first week in the department, but the briefings themselves were from someone else … like the PMO. Anyway, apparently he is going to repeat the “on course” claim, slightly amended, on Friday at the Economic Club of Canada (formerly the Economic Club of Toronto). There are a number of key challenges ahead, including the oil sands and climate change and significant work remains to be done. However, there’s good reason to be optimistic as federal and provincial measures already undertaken show that one quarter of the work needed to meet our emissions reduction target has already been done. Past speakers include Ezra Levant last year, and – wait for it – Lord Christopher Monckton in 2009 (part of the Friends of Science tour). Sounds like Kent has found the right place. There were reports of a tailings pond leak that the Alberta government checked and said was not happening; is it possible Kent was referring to that specific instance?